Samuel Blanchard How was born on October 14, 1790 in Burlington, New Jersey. He attended the University of Pennsylvania and earned a bachelor's degree in 1810. Following his graduation, How found employment at Dickinson College as the principal of the Grammar School and tutor for the College under the presidency of Jeremiah Atwater. He would subsequently become a confidant of Atwater's, who was greatly disappointed with his departure in 1811 to follow theological studies. How was ordained in the Presbyterian Church of Philadelphia on November 9, 1815 and began service in a series of posts throughout New Jersey. From 1823 until 1829, How served as pastor of a church in Savannah, Georgia. 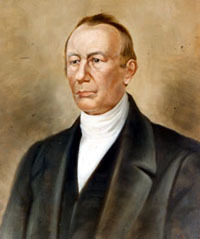 Upon the resignation of William Neill as president of Dickinson College in 1829, the Board of Trustees elected Philip Lindsley to be his replacement. Lindsley, however, declined the position, and the Board in turn elected How, who was formally installed in his new office on March 30, 1830. How assumed the leadership of Dickinson College at a difficult time. Disagreements among the trustees and faculty about educational purpose and activity in a changing society had left the institution in great turmoil. In addition, local Presbyterian support was becoming more fragmented, and financial problems remained a concern. Plans were proposed, with the apparent support of How, for the radical reworking of the curriculum, which in effect abandoned the classics in favor of a more "practical" education. In the meantime, the student body had continued to decline to a point where enrollment consisted of merely five senior students, no juniors, seven sophomores, and eleven freshmen. This forced the Board of Trustees, in February 1832, to reach the conclusion that the College must be closed following the current session. The Grammar School, however, was to remain in operation. This closure of the College would mark the end of How's brief and troubled presidency. This also marked the end of Dickinson's relationship with the Presbyterian Church, as the College would reopen in 1833 with a new Board of Trustees, and under the general direction of the Methodist Church. After leaving Dickinson, How returned to the ministry and became the pastor of the First Reformed Dutch Church of New Brunswick, New Jersey, holding that office until 1861. Near the end of his career, in 1859, he was elected to serve as president of the General Assembly. How remained in New Brunswick until his death on February 29, 1868.